Not even multichannels could TEN’s raid on ratings last night -with the network having a red hot shot of taking the week. 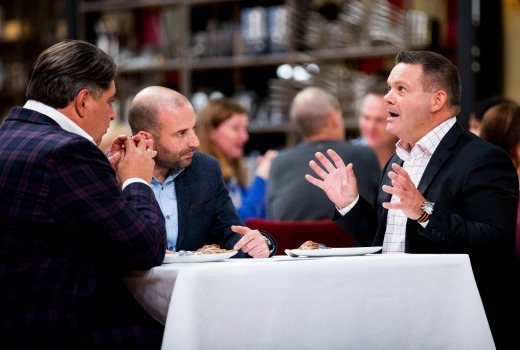 MasterChef Australia‘s semi final topped the night with 1.44m viewers -its biggest numbers all year. The penultimate episode, which saw Harry leave the kitchen, again topped the Demos. It was TEN’s biggest primetime audience in a year. Earlier Seven News and A Current Affair both won their timeslots. Love Child was down against heated competition. But it was ABC’s shocking Four Corners expose that today has the nation talking with Prime Minister Turnbull announcing a Royal Commission. It ranked second in its slot. TEN network won Monday with 26.6% then Seven 26.4%, Nine 22.7%, ABC 19.6% and SBS 4.7%. Following MasterChef for TEN was Have You Been Paying Attention? (827,000). The Project drew 803,000 / 522,000, TEN Eyewitness News was 527,000 and NCIS: New Orleans was 242,000. Seven News was best for Seven with 1.24m / 1.16m then Home and Away (784,000), Highway Patrol (763,000), The Chase (728,000 / 444,000), World’s Angriest (522,000) and Movie: The Bourne Ultimatum (521,000). Nine News (1.07m / 1.02m) led for Nine then A Current Affair (970,000), Hot Seat (602,000), Love Child (587,000 / 555,000), 20 to One (572,000). Footy Classified was 161,000 in 3 cities. ABC News (856,000), 7:30 (809,000), Media Watch (757,000), Australian Story (740,000), Four Corners (723,000) and Q&A (574,000) comprised ABC’s evening. SBS was down with Michael Mosley: E-Cigarettes (200,000), Predict My Future: The Science of Us (163,000), SBS World News (131,000) and The Island with Bear Grylls (96,000). ABC2’s Peter Rabbit led multichannels again with 337,000. I think a lot of MasterChef’s ratings last night can be attributed to people wondering why HYBPA hadn’t started yet. HYBPA was promoted as “9.10”. TEN’s audience dropped by 613,000 between MC and HYBPA so that claim is pretty illogical. Such a pity Love Child didn’t rate better, probably the best Aussie drama in a long time for me. Good to see Masterchef doing so well, though it wouldn’t have done so well if it had some decent competition. Yes, Lovechild is one of the better local dramas. Burning it off in double episodes would definitely not be helping it achieve good ratings. Deserves better treatment by 9. Has another season of Love Child been commissioned? Channel 9 are sure rushing it out of the way before the Olympics and the ratings are telling. How did the new Top Gear go on 9GO! MC is doing so good. Just proves don’t tamper with a winning recipe hahaha. Just proves that TEN is pretty much a one-hit wonder and it all ends tonight!! With The Bachelor & Offspring, and the other networks laying low, TEN will go close to winning the week. I’d tip a primary channel win in any case. Will be interesting to watch.